If you've ever been to Nepal, it isn't that rare to see someone smoking some Ganja, the good old herb or perhaps booming some Charas from the mountains. But to see someone tripping on Hallucinogenic Honey is a rarity. Mother nature has so many gifts for us hidden in plain sight, we would be amazed ... ! There are so many more discoveries yet to be made ... of legends that never seem to fade. Plant based medicine has been used by mankind for as long as we remember ... even most of these pharmaceutical drugs are manufactured using plants from the Amazonian rain forest with other additives that we definitely can do without. Honey is well known for its medicinal qualities however the honey gathered from these steep Himalayan cliff sides also has a psychedelic angle to the healing. It gets its Hallucinogenic properties from the nectar of certain rhododendron plants that grow in this region. The Himalayan Honey Bee which pollinates 80% of the plants that grow in this region is one of the biggest bees in the world. The hives holding all this 'Mad Honey' as its called sometimes, are believed to carry upto 60 Kilos of Honey in each. Each Kilo of this Red Hallucinogenic Honey is sold in the market for something around $15 a kilo. This 'Red Honey' is also very popular among middle aged men who use it for its aphrodisiac like properties as its known to enhance sexual performance. 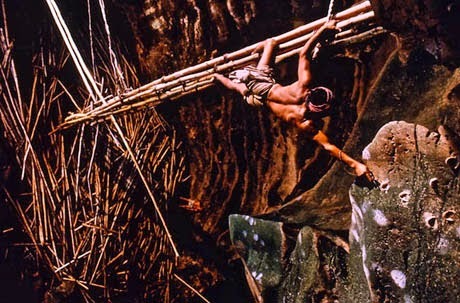 "Honey Hunters of Nepal" is a documentary film by freelance photo journalists Diane Summers and Eric Valli about the Gurung tribesmen of west-central Nepal who enter the jungles in search of wild honey where they use indigenous tools under precarious conditions to collect honey. 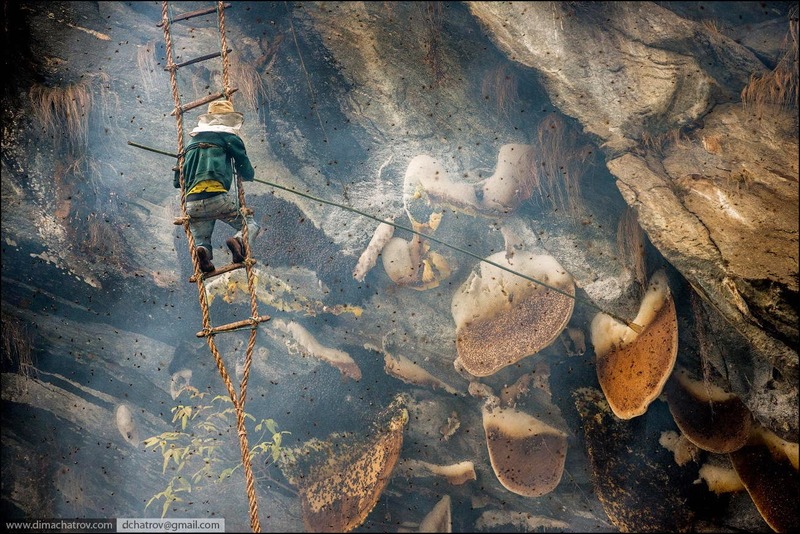 Twice a year high in the Himalayan foothills of central Nepal teams of men gather around cliffs that are home to the world's largest honeybee, Apis laboriosa. It is over twice the size of those in the UK where their larger bodies have adapted to the colder climate for insulation. As they have for generations, the men come to harvest the Himalayan cliff bee's honey. ... The Honey is safe for human consumption, in moderation of course ! Else, people won't be consuming it ... init ?